I am trying to build a motorized cable drum which retracts the cable lying on the ground. I am using a 165rpm 1.3Nm (continuous torque) spur geared DC motor. 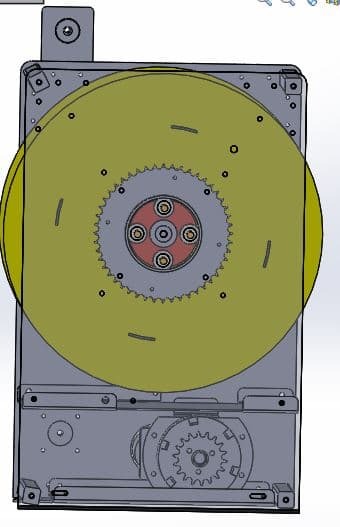 I have a small sprocket (05-B1 standard, 22 teeth) connected to the motor shaft and have a bigger sprocket (05-B1 standard, 50 teeth) connected to the drum. A chain (05-B1 standard)is used to connect these two sprockets vertically and hence engage the motor with the drum. The diameter of the small sprocket is 50mm and the big sprocket is 125mm. The weight of the small sprocket and big sprockets are 200 and 500 grams respectively. The length of the chain is 900mm (8mm wide). The diameter of the drum is 200mm. The total weight of the cable that the drum must reel in is 5 kgs. Now, since the sprocket reduction reduction ratio is 2.27(50/22), the total torque available at the drum to pull the cable inside should be 1.3Nm x 2.27 which is 2.951Nm (29.51 kgcm). Is this calculation right ? Do I have to take any other factors into consideration here ? Also, I believe this torque should be enough to pull the cable inside. If not I should either use a motor with higher torque or increase the number of teeth on the bigger sprocket so that the gear reduction ratio increases. Which among these two methods is recommended ? PFA pictures of the whole system. If the cable is long and lying along mud (open ground), the friction can be too high for the system. It may be enough indoors or smooth surfaces. The calculation appears to be correct.